Santa Maria della Misericordia Hospital in Rovigo, is a large public hospital within the Veneto region of North East Italy. It covers the whole spectrum of medical procedures and requires the very latest medical technology. An MRI scanner is vital in any modern hospital for the accurate diagnosis of many medical conditions. The hospital in Rovigo carries out over 5,000 scans each year for neurological, spinal, vascular, body and orthopaedic conditions, as well as for accident and trauma victims. Speed – to treat patients quickly, rapid imaging is vital and the huge amounts of data then need to be made available to doctors and integrated with the patients’ other health data on a central IT system. Image quality – the most accurate diagnosis, requires the highest quality images and scanners with the very latest technology. Reliability – Reliably performing over 5,000 scans per year requires a good maintenance programme to ensure that the scanner is operational at all times. Open scanner design – traditional MRI scanners confine patients in a narrow tube. This makes it difficult for patients with claustrophobia, or for many children who can find it frightening. An open MRI is more comfortable and enables scans of trauma victims, who are often connected to drips or other life-saving equipment. Santa Maria della Misericordia Hospital selected Hitachi’s Oasis, 1.2 Tesla Open MRI Scanner. This is the very latest technology in MRI scanners and gives image quality comparable with 1.5T traditional tube type scanners, which provides the greatest accuracy in diagnosis for patients. This is the very latest technology in MRI Scanners and gives quality comparable with 1.5T. The Oasis sets new standards for patient comfort and care. It has a truly open design, with a wide and deep aperture, allowing patients to have an unobstructed view of their surroundings. This is particularly important for claustrophobic patients as they can now be scanned without the need for sedation. 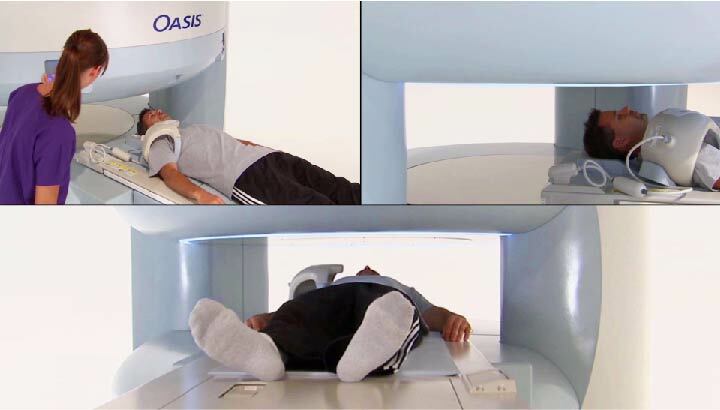 The open design also means that Oasis can accommodate patients of a larger size who cannot fit into a conventional MRI. The wide patient table can support over 300 kilos and can be lowered for patients with mobility problems. Furthermore the asymmetrical alignment of the table allows optimal scanning position. Oasis can even be used to monitor patients during minor invasive surgery. Thanks to the open design architecture, parents can be close to their child during the scanning process, or a son or daughter can accompany an older parent, to help put them at ease during a scan. This leads to a reduction in the need for re-scans, which saves valuable time and expense. 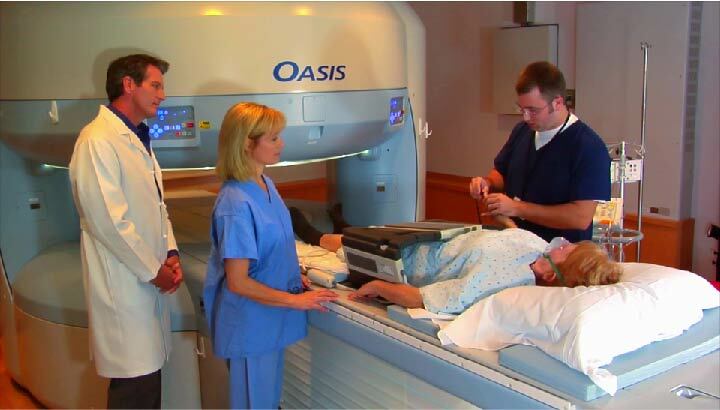 Due to this unique architecture, Oasis easily accommodates patients who are connected to other medical equipment, such as a drip or a heart monitor, including patients who may have suffered a recent trauma and arrived into the A & E department providing a rapid diagnosis of their injury or condition. Oasis can even be used to monitor patients during minor invasive surgery, such as biopsies. Oasis gives us a wide array of different imaging and post-processing tools. As well as high quality clinical imaging, Oasis provides a wide array of different imaging and post-processing tools, to ensure high diagnostic performance. These include 3D volumetric acquisition, which enables doctors to view any angle, even after the scanning procedure has taken place. This important feature can also assist surgeons to calculate the best trajectory for an incision during a surgery. Importantly, Oasis helps with patient management and saves time, because it integrates with the hospital's IT system and transfers patient data directly to the hospital's database, using Hitachi's software Interface. The Hitachi Oasis Open MRI scanner is a powerful, reliable imaging system for clinicians and enables them to provide the very best care for patients. For the hospital, that is the priority. 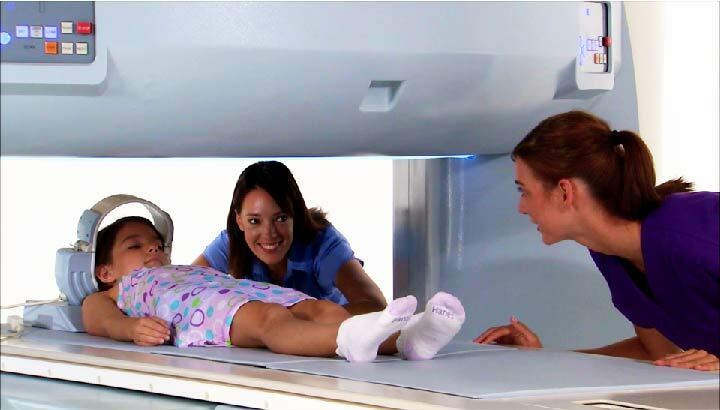 For over 25 years, Hitachi has been a pioneer in the innovation and development of patient-friendly MRI systems. One of its goals is to set new standards in patient-centric care and as part of that goal it produced the world's first open MRI scanner. It has continued to develop that technology, leading to the Hitachi Oasis 1.2T Open MRI Scanner. For over 25 years we have been pioneers in the innovation and development of patient friendly MRY systems. As well as continuing to drive innovation in medical equipment, Hitachi is also pioneering big data analytics solutions to help prevent disease, and improving advanced data storage systems to better manage the vast amounts of patient data. As part of its ongoing commitment to Social Innovation, it is delivering healthcare for everyone, from prevention and early detection of disease to diagnosis, therapy and aftercare. All of this in a sustainably, affordable way. Santa Maria della Misericordia hospital in Rovigo, Italy is a large central hub hospital within the Veneto region of North East Italy. It is a public hospital and covers the whole spectrum of medical procedures. Hitachi is committed to a Global healthcare business that supports a healthy and safe society and is also committed to delivering advanced medical solutions which meet the demands of both medical staff and patients worldwide. Hitachi Medical employs over 16,000 specialists in their worldwide research and development facility.